Blessing: Bes is a powerful protective deity, with a special concern for pregnant women and young children. His grotesque appearance and thunderous dances frighten away demonic spirits. He is also a god of fertility and sensuality, and presides over healing and oracles. 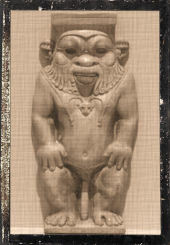 Equated with: Pan, Seilenos, Min; “Pantheistic Deity”, often linked with Tawret in paintings and reliefs but not known to be fully syncretized with any other deity. Associations: Knives, feathered plume, mask, sistrum, doorways and entrances; dancing and performance, especially comedy; tambourines, sistrums, and percussion instruments; mirrors, khol, make-up, perfumes and scented oils; eroticism, fertility, and childbirth; soldiers and guards; apotropaic wands; lions and lion skins, cats and felines; tattoos and prophecy. Festivals: Besia (15 Payni); dancers dressed as Bes were also known to attend performances on regular festival days, in particular feast days to Bast. Ways to honor: Caring for pregnant women and children. Stand up for “the little guy”; support HIV/AIDS and STD awareness; advocate for women’s reproductive rights; baby-sit or volunteer for troubled youth; learn how to make people laugh or play (safe) practical jokes on people; take up dancing or attend dance performances (particularly cabaret); practice dream-work or incubation; learn a simple and entertaining form of divination; keep doorways clean and hold the door for other people; be hospitable.